Sora Travels Blogger Template is a Creative and stylish blogger theme. It is perfect for creative people such as fashion blogger, photographer or for the stylish traveler. It is unique that emphasize your taste and vision of a beautiful design. All of your subscribers will be glad and happy to see such a nice and mod site (smiley). 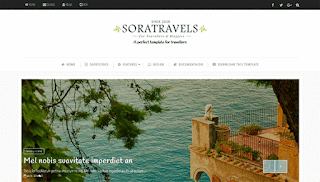 Sora Travels Blogger Template is adapted to all devices including phones and tablets.